Flintstones multiminerals typically include both minerals and vitamins. They are intended for use by children and help make up any lack of nutrients in the diet. 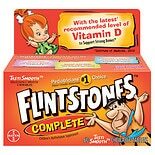 Flintstones has become a famous brand of children's vitamins that kids will actually take due to their candy-like taste and texture. Nutritional supplements for kids are specially formulated to provide an appropriate dose of vitamins and minerals to ensure optimal growth and development. Children should not take multivitamins designed for adult use, since these may have doses that are too high for a child's system to handle. Flintstones multiminerals come in a few different forms. Chewable vitamins include 20 different nutrients and come in shapes and colors that appeal to kids. 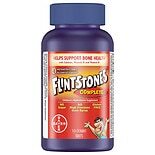 Flintstones multiminerals also come in gummy form. Some are also sour tasting to appeal to kids who enjoy sour flavors. These soft supplements are fun to eat, so kids tend to like them. Most kids who take Flintstones multiminerals take one each day, often in the morning just after waking up or in the evening before going to bed. These products should be kept out of reach of children because kids sometimes begin to think of them as candy and could potentially overdose if they take too many at once. In some cases, pregnant women who cannot tolerate normal prenatal supplement may take Flintstones multiminerals and multivitamins at the recommendation of a doctor. In addition to taking a nutritional supplement or multivitamin, kids and adults alike should both consume a healthy diet with high levels of nutrients to ensure their overall health.